An imaginary train station, a train that forms and deconstructs itself in front of the eyes of hundreds of spectators, and passengers boarding to meet their destiny. 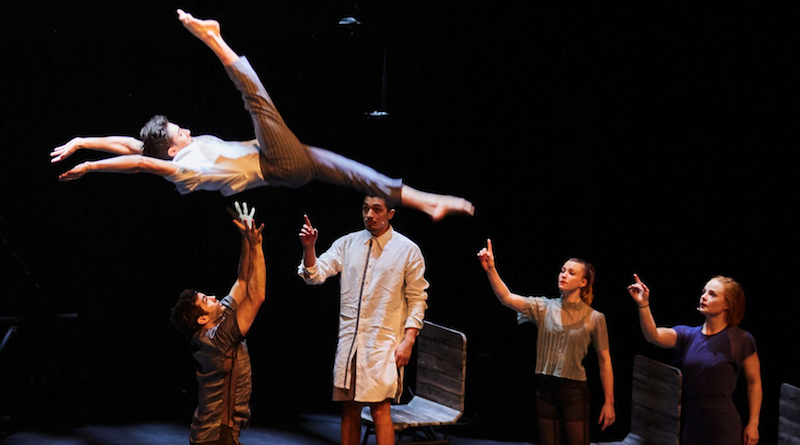 November 22nd at TOHU marked the official departure of the new creation of 7 Fingers, from artistic director Shana Carroll. In Passagers we find the signature of the collective, combining circus, music, contemporary dance and physical theater. Throughout the show we see the clever interweaving of these disciplines, which form the soft envelope in which the artists evolve. Passagers does not revolutionize the genre; it reproduces the usual dramaturgical pattern of 7 Fingers, with a main theme defining the story and aesthetics of the show, without being very thorough though. In their earlier productions,Triptyque (Samuel Tétreault, 2015) they innovated more in the form. This time, the research on the train universe allows us to quickly establish clear physical places and the multiple states of mind in which the audience immerses itself. If the nostalgia of the past is deeply associated with the train, it always pulls us forward. It is a perfect paradox to embody an everlasting movement, as we see in constant undulations in the bodies of the artists. Less restrictive in terms of space than the car, the bus and the plane, the train makes it possible to move in the cabin and between the wagons, creating an environment more suitable to social interactions than its counterparts. This idea of “mobile immobility” is well exploited in Passagers. Maude Parent shines in a contortion number where she stops the time in a wagon and slips between passengers, borrows their accessories and changes their positions, having fun with this forced intimacy between strangers. However, one wonders if the highly theatrical aspect of the scene eclipses the prowess of contortion. Parent performs on a Radiohead’sCreep song cover, and Maude Brochu‘s powerful voice induces strength and fierceness into Parent’s character. The choice of the song is spot on. In contrast to the sadness of the original version, this one rather shows the artist reclaiming the power of the word and highlights the extraordinary properties of her body. Creep, and proud of it. Fortunately, Parent‘s contortion figures are seen throughout the show, sprinkled like a topping on every number and transition. She immediately appears in the next act performing a live song, Tom Waits’Burma-Shave, which we can find on the soundtrack of the show available on Bandcamp. The show runs on a pre-recorded soundtrack with two live numbers, including Freyja Wild that performs the cheerful piece Roam, with the ukulele. These are high points of the show, and proves the versatility of each Finger. Music design is from Colin Gagné and he collaborated with several Montreal-based artists, such as Dominiq Hamel,Jérôme Dupuis-Cloutier,Alexandre Désilet and Frannie Holder, whose velvety voice introduces us to the vulnerability of Sabine van Rensburg‘s Aerial silk number, and Boogát, whose urban rhythms go along with the jugglerSereno Aguilar Izzo. The prologue, epilogue andSleeping Car pieces are based on a music theme byRaphael Cruz, circus performer and close collaborator of 7 Fingers, who suddenly passed away in January 2018. His musical presence refers to memory, loss and suffering, themes that Shana Carroll addresses in Passagers. Three numbers particularly stand out by the revisited work of the circus apparatus. First, the static trapeze duet with Sereno Aguilar Izzo andSabine van Rensburg.Izzo stands as a carrier and catches his partner, who becomes the link between the stage and the trapeze, while the other acrobats remain on the ground under the device. The group propels van Rensburg upwards as she invests in the space in between and create original figures.Carroll had explored this “hand to trap” formula with three acrobats in the part Road to Fame ofParamour (Cirque du Soleil, Philippe Decouflé, 2015). This time though we don’t feel the struggle, but rather the support of the group. It creates a wonderful image from which solidarity and kindness emerge. In addition, we acknowledge van Rensburg‘s agility on the aerial silks. The moment where she stands straight on her legs and slowly comes down while into the fabric is impressive. Expert in his discipline, Brin Schoellkopf deploys himself completely on the tight wire. The contrast between his willowy body and the wire always creates interesting images. He does splits, windings around the wire and of course balancing but it’s the use of the device that is the most surprising. Halfway thru the number, the acrobats move and rotate the tight wire apparatus, whileSchoellkopf is still standing on it. The edgy process creates an additional tension where one feels a physical and mental struggle to stay in balance. The prowess is even more difficult to achieve and the symbolism is powerful. On the other hand, performance errors in this act as well as hula hoop and juggling suggest that apparatus-based acts are under rehearsed. It’s nerve wracking to play with a new vocabulary and the audience wants to be reassured by the technique, which it not quite on point yet. They have the strength to pull it off but need more time to master the level of technical difficulty required. Finally, the Russian cradle number stands out by the way it weds aerial acrobatics and hand-to-hand figures. The space above the carrier is rarely exploited, which is well done by Louis Joyal, who leans on the shoulders, the back or uses the hands of Samuel Renaud to start the acrobatics, and finishes it in the air. He uses the passages between the two platforms as pretext to do hand-to-hand with his partner. The Russian cradle act closes the show, followed by a short epilogue. Ana Capelluto‘s scenography is nice and effective; with chairs and baggage trolleys being the main moveable elements of the stage set. The use of fabrics in pastel or faded colors by costume designer Camille Thibault-Caron highlights the bodies of female acrobats, as we stay very close to everyday clothing, with t-shirts and pants for the men. With the exception of some brighter pieces (Maude Parent‘s kimono for instance) the whole thing is rather neutral. This sobriety is necessary to appreciate the multimedia projection that plays a large part in the show. Taken separately, these three scenographic elements would be dull, but together they form a coherent whole without ever overloading the stage. Integration of multimedia in circus shows is an increasingly common practice and 7 Fingers are no stranger to the trend! One of the three parts of Vice & Virtue (Samuel Tétreault, 2017) presented by Montréal Complètement Cirque, was created in the dome of the Société des Arts Technologiques of Montreal, an immersive audio and video 360 ° environment. Finely done, the projection in Passagers is interesting for transitions, where we find ourselves in a subway tunnel or in abandoned train stations, but too often we feel that its use puts emphasis on an already strong statement. However, its contribution enhances the Chinese pole number. Conor Wild walks on the pole, first horizontally, giving the illusion that he is walking on the railroad projected in the background. He only hangs to the pole when it is leaning at 45 ° and then turns out to suspend himself on an electric pole in a field. Thanks to the projection, we follow him at the top of the pole in the cloudy sky, or at ground level, according to the figures he creates. The work with the shadow of the acrobat also contributes to the visual effect, something we also noticed with the the Russian cradle act. Would it have been interesting to use the projection to increase the effect of train movement and loss of balance in Sleeping Car, rather than see Brin Schoellkopf asleep for eight minutes? How can we use multimedia to create a cohesion between the performance and the environment? 7 Fingers begins to answer the question with this artistic proposal and it’s worth it to deepen the concept. One of the strengths of the company is to bring together people from different backgrounds under one roof, driven by the powerful desire to dream. Failing to share common realities, spectators are allowed for the time of the show, to join in a fake reality, and to follow the path traced by director Shana Carroll. The painful ordinary of everyday life is magnified. It is hard to ignore the current social and political context when we see Passagers, and to not juxtapose this lyrical trip with the harsh reality of migration in 2018. We are passengers to where, to what exactly? To exile? To a better life? We will not lend false intentions to 7 Fingers here whether or not to touch on a complex and polarizing global issue. But using the train as a metaphor of passage and transition naturally brings up these reflections. The circus has this annoying tendency to move us, to amaze us and to make us think. So we think. Why this urge to travel? Why the need to slip into the skin of these ephemeral characters? Why the need to break the anonymity and reveal each other? Why create a new show? Because we still need to see strong women like Freyja Wild, as a solid carrier of a three acrobats high column. To see the strength of the group at work. To feel the solidarity. Because beauty and tragedy make sense in their cohabitation. Because no matter the hardships that pull us backwards or the ties that keep us still, we have to keep moving forward. Fascinated by the human condition, 7 Fingers creates performances that celebrate our world, our time and our humanity. Once again, they shine the spotlight on marginalized, anonymous men and women who carry with them their dramas and their hopes. The essence of Passagers just might lay there. In this need to keep on going. 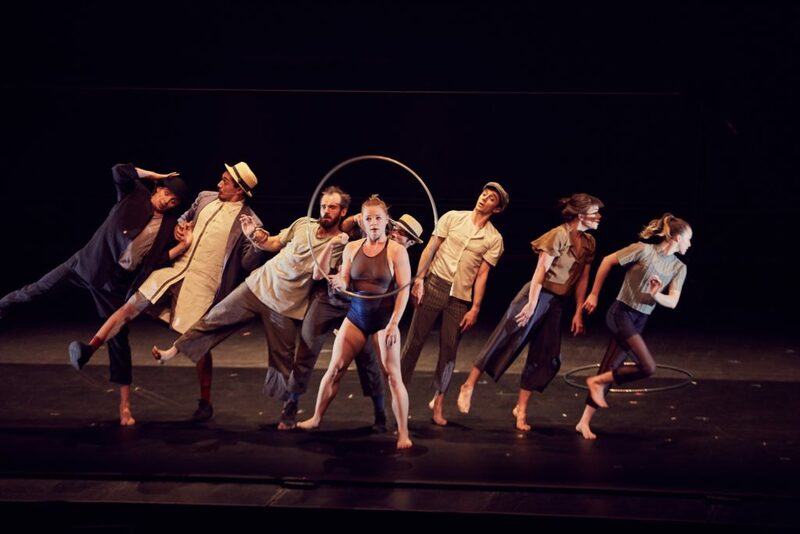 Related content: The 7 Fingers Opens Creation & Production Center– Not Business As Usual, 375 Celebration Brings Big Circus: 7 Fingers Explores Montréal’s History. Maxime is a Montreal-based actress and contemporary dancer, working with the inclusive dance company Corpuscule Danse since 2014. She worked with artists in Canada, France and Germany. She performed in shorts films, TV series, and will be playing in Montreal theatrical institution Centre du Théâtre d'Aujourd'hui in March 2019. Freelance journalist since 2007, Maxime is (sometimes) a radio host, TV columnist, and blogger, covering the independent music scene, French comedy scene, and circus arts. She's an advocate to access to culture for all. Maxime est une actrice et danseuse contemporaine travaillant à Montréal. Elle est interprète pour la compagnie de danse inclusive Corpuscule Danse depuis 2014. Elle a travaillé avec des artistes au Canada, en France et en Allemagne. Elle a joué dans des courts métrages, des séries télévisées et se produira au Centre du Théâtre d'Aujourd'hui, institution théâtrale montréalaise, en mars 2019. 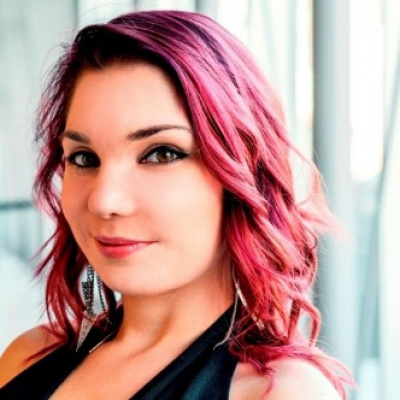 Journaliste depuis 2007, Maxime est (parfois) animatrice de radio, chroniqueuse télé, blogueuse, et couvre la scène musicale indépendante, l'humour et les arts du cirque. Elle milite pour un accès à la culture pour tous. Maxime is a Montreal-based actress and contemporary dancer, working with the inclusive dance company Corpuscule Danse since 2014. She worked with artists in Canada, France and Germany. She performed in shorts films, TV series, and will be playing in Montreal theatrical institution Centre du Théâtre d'Aujourd'hui in March 2019. Freelance journalist since 2007, Maxime is (sometimes) a radio host, TV columnist, and blogger, covering the independent music scene, French comedy scene, and circus arts. She's an advocate to access to culture for all. Maxime est une actrice et danseuse contemporaine travaillant à Montréal. Elle est interprète pour la compagnie de danse inclusive Corpuscule Danse depuis 2014. Elle a travaillé avec des artistes au Canada, en France et en Allemagne. Elle a joué dans des courts métrages, des séries télévisées et se produira au Centre du Théâtre d'Aujourd'hui, institution théâtrale montréalaise, en mars 2019. Journaliste depuis 2007, Maxime est (parfois) animatrice de radio, chroniqueuse télé, blogueuse, et couvre la scène musicale indépendante, l'humour et les arts du cirque. Elle milite pour un accès à la culture pour tous.